In recent years, the phonology - morphology §interface has been a topic of considerable interest §in theoretical linguistics. This book represents a §contribution to the study of this interface. 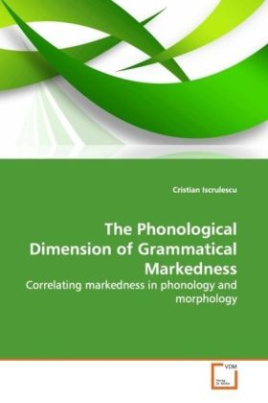 Couched §in the framework of Optimality Theory, it explores §the correlation between grammatical markedness and §the phonological properties of outputs inflected for §morpho-syntactic categories on a grammatical §markedness hierarchy. The main claim made in the §book is that, under otherwise similar phonological §conditions, outputs carrying specifications for a §marked member of a given grammatical category can §license a given type of marked phonological §structure to an extent that is equal or greater than §outputs inflected for the unmarked category. §Illustrations are provided for the morpho-syntactic §categories of case (Old Saxon), number (Romanian) §and voice (Mayak). The book is mainly intended for §theoretical linguists, researchers and graduate §students, but may also present interest for a larger §circle of readers.